The type specimen of the genus Amebelodon is installed in the Nebraska State Museum, the University of Nebraska, Lincoln. It consists of a mandible with tusks and teeth, all of which are dense and perfect, barring minor cracks and breaks. One toe bone and part of a rib found associated with this mandible may belong to this animal. It was discovered by Mr. A. S. Keith on his farm near Freedom, Frontier County, Nebraska; was secured for the palaeontological collections of Hon. Charles H. Morrill by Mr. Phillip Orr, April 4, 1927; was briefly described and figured in a Museum bulletin June, 1927.1 After a long but unavoidable delay, this mandible has just been mounted and the first photographs with correct measurements are now possible and are presented herewith. Preliminary drawings and measurements were made while the specimen was still in its plaster cinches. This unique specimen, representing a new group of longirostral mastodonts, has been named Amebelodon fricki, and the group designated the Amebelodonts, or shovel-tuskers. Amebelodonts are such distinctive elephants that they plainly belong in a group by themselves, namely the sub-family Amebelodontinae. 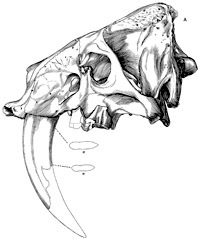 In them is realized the culmination, in the late Pliocene or early Pleistocene, of the flattened tusks and lengthened mandible of Phiomia osborni of the Egyptian Oligocene.